This architectural portrait of the bride and groom is one of my favourite images I took at this Atlantis wedding in Toronto. The walking platforms create leading lines directing the viewer's attention to the bride and groom. It is a beautiful wedding photo with a fashion look. A few architects and graphic designers hired me to photograph their wedding after they saw this image. When I saw this picturesque scene, I begged the bride and groom to take a last shot before they went inside. The leading lines, the diagonals, the lights and shadows interplay are great ingredients for a beautiful wedding photo. As such, I asked the bride and groom walk on the suspended bridges towards each other. In terms of composition, the bride and the groom are positioned according to the rule of thirds. 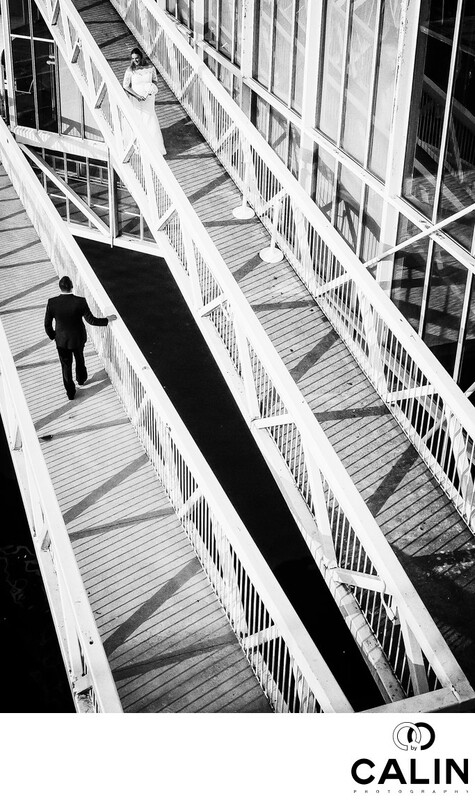 The bridges create a visual leading lines emphasizing the subjects. The result of our efforts was so gorgeous, this photo made it to their wedding album. When I started my Toronto wedding photographer career, I used to shoot zoom lenses. For this picture, I used the Canon 24 - 70mm F2.8 lens shot at 24 mm to capture the suspended bridge and of the splendid architecture. Atlantis Pavilions Toronto is a unique wedding photography location. It has lots of amazing backdrops such as a gorgeous view of downtown Toronto, of Ontario lake and the former IMAX theatre. Location: 955 Lake Shore Blvd W, Toronto, ON M6K 3B9, Canada.